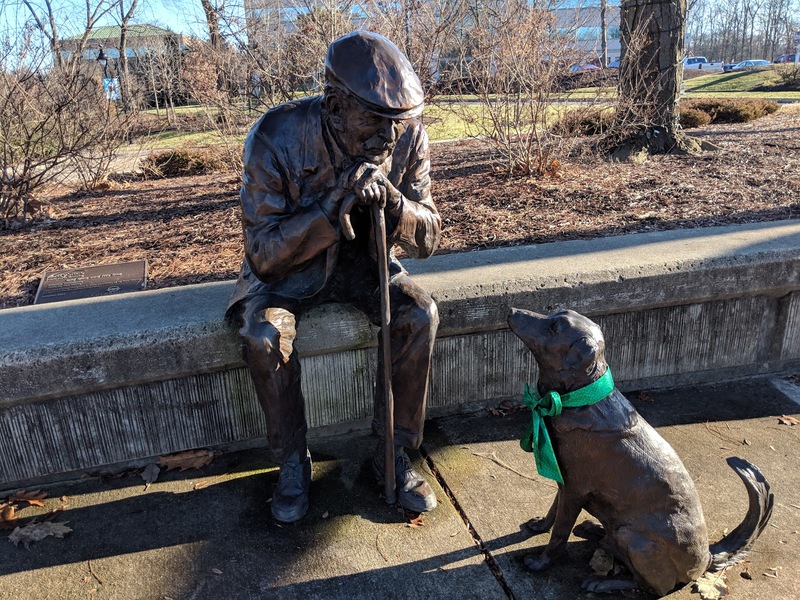 When we first spotted these statues, installed in 2007 at the Commons Way entrance to Lincoln Park Civic Commons, they were so lifelike that we thought they were a real man and a real dog. Kudos to Santa Fe artist Glenna Goodacre for capturing the heartwarming emotion of a man and his best friend. Someone, I can only assume part of the city's parks and recreation department, added the green bow around the dog's neck for this holiday season. Very nice touch. This is just one of ten locations in Kettering to have art installed, as detailed at the link below. I have some exploring to do. 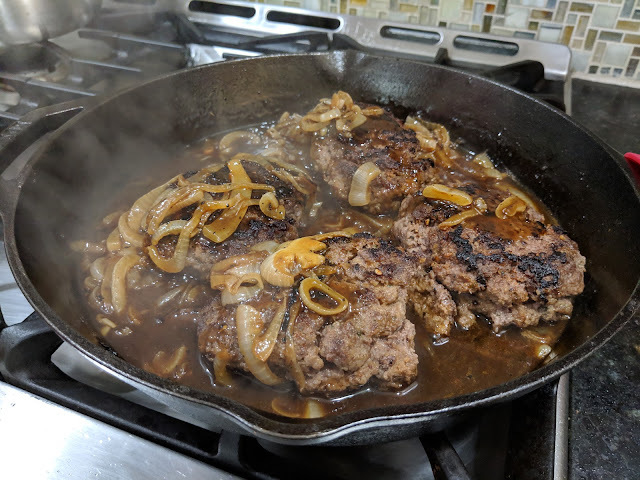 This is a great way to turn your average hamburger-for-dinner into a tasty-something-special. Mix together the ground meat with seasoned breadcrumbs, ketchup, dry mustard, Worcestershire and a crumbled beef bouillon cube then form the "steaks", and top with a gravy consisting of an onion, beef broth and the other ingredients shown in the recipe at the link below. Santa brought me a 32" Samsung Smart TV as an upgrade to the monitor connected to my Macbook Air, bringing more screen real estate, Netflix, Amazon Video and an extra HDMI port. But the screen looked "fuzzy" when displayed from the Mac, and it required quite a bit of searching to reveal the most unexpected resolution. By default the first HDMI port, the one I plugged the Mac into, is called "HDMI 1", and simply renaming it to "PC", which changes the scaling of the source to improve picture quality for attached computers, resolved the issue. Wouldn't have guessed that in a million years. Currently available only on Google Pixel phones, Call Screen mimics, digitally, what many of us have done with answering machines for years. 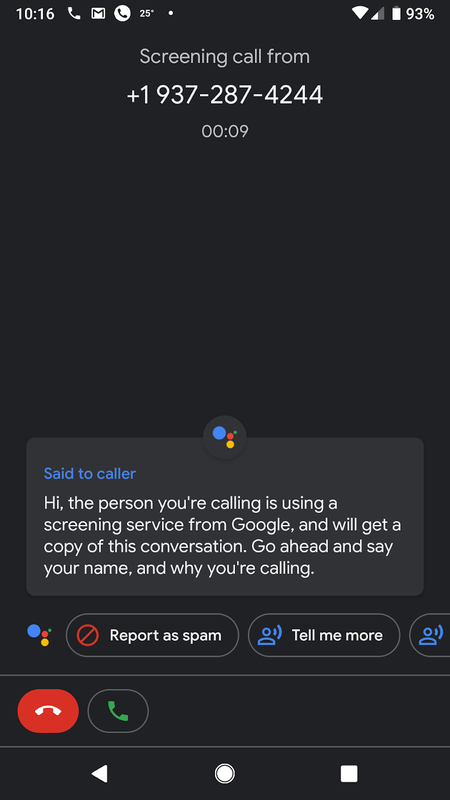 Let the machine answer and spew out its "we're not available, blah, blah" message, then listen for the caller to identify themselves before deciding if you want to talk. 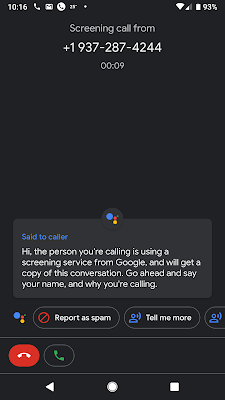 When a call comes into the Pixel, you have a "Screen call" option which activates this process. The caller gets the message shown below and whatever they say is on-the-fly transcribed to text, and that's usually enough to determine if the call is legit or an annoying telemarketer or scammer. You can report the number as spam, ask for more information, tell them you'll call back later and other options. Google hit a home run in 2018 with this killer feature. A very Merry Christmas to you, your families and all those you love. Take a moment and tell those closest to you how much you love them. This YouTube link adds to the spirit, with three hours of classic Christmas music, complete with holiday scenery. All the presentations from this year's TEDxDayton are now available on YouTube, with the individual links at the URL below. I particularly liked Mark Fogel's talk on leadership and followership as a US Air Force fighter pilot and Dr. Julie Servaites talk on A Good Death. 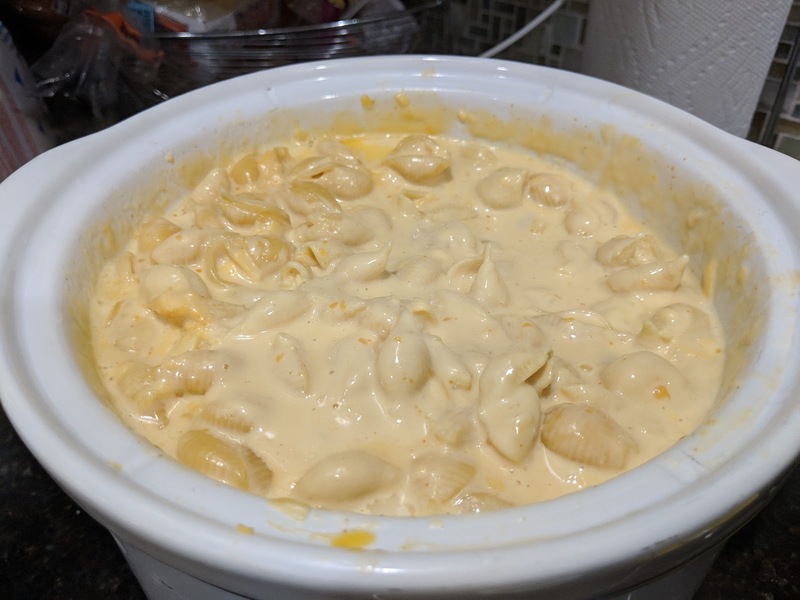 A total of four cups of grated Gruyère, American and Sharp Cheddar cheeses, a couple cans of evaporated milk and two cups of milk make this a slower cooker full of decadent delights. Super easy to make, only one pot to clean and perfect for the carbotarians in your family. Seeing a Duke basketball at Cameron Indoor Stadium has been on my bucket list for a very long time, but no longer. 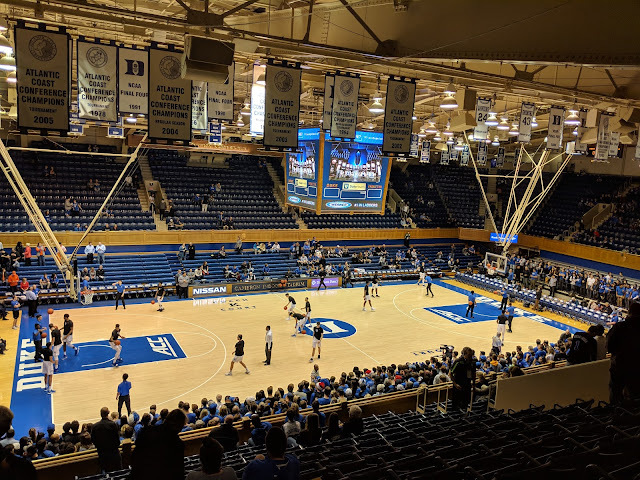 Duke defeated Princeton 101-50, after shaking off some post-final-exam rust, on December 18, 2018 while my friend Bob and I watched from the rafters. That sounds like far away, but in this throwback stadium with a capacity of only 9,314, you're really on top of the action, which the picture below does not do any justice. Best of all, we saw the most dynamic Duke team in history with freshman R.J. Barrett, Zion Williamson, Cam Reddish and Tre Jones playing like the NBA-ready players they are. 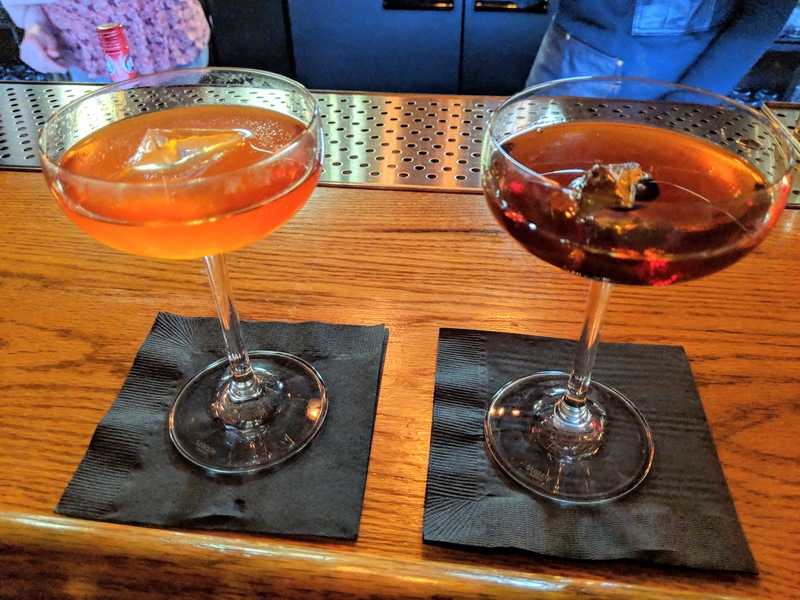 One of Dayton's newest specialty cocktail bars is the Van Buren Room, located at the Belle of Dayton distillery on Wayne Avenue. I opted for the rye whiskey-based House Manhattan (on the right below) while my wife went with the Chocolate Negroni, made with their own Belle of Dayton gin. It's a very small place, so I suggest you have a backup plan in case you run into a crowd. A local library card is all I need to borrow free (I love free) audio books using the Libby smartphone app. 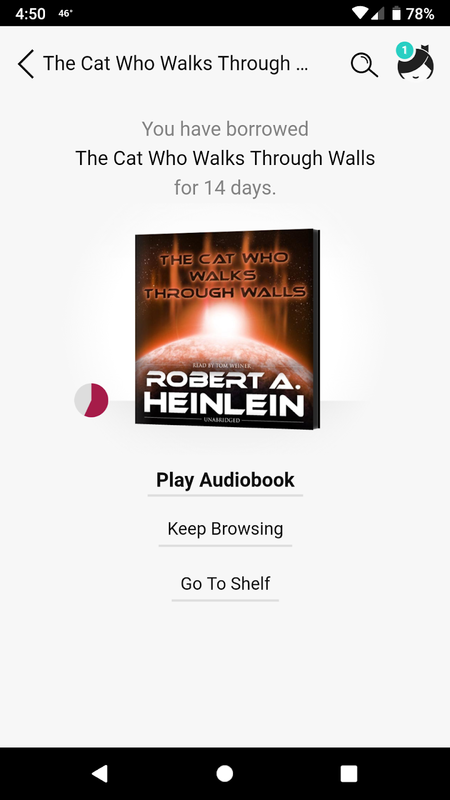 My current car trip is giving me the opportunity to listen to the 14-hour, Robert Heinlein science-fiction classic, The Cat Who Walks Through Walls. I also have a hold on Heinlein's Stranger In A Strange Land, waiting for a copy to become available. This all works just like a trip to the library, but without the need to whisper. This link will take you to the Dayton Metro Library's web site, where you can install Libby on Android, iOS or Windows Phone. The best new Christmas movie to come along in ages arrived this season on Netflix, with Kurt Russell starring as Santa Claus in The Christmas Chronicles. You're sure to laugh and shed a few tears as Santa, with the help of two children, eight reindeer and enthusiastic elves try to save Christmas after Santa falls behind schedule. Local entrepreneur Whitney Kling creates one boxed salad per week, delivered on Tuesdays to anywhere in Dayton, Kettering or Oakwood for $12. Orders are due by the previous Sunday, payable via Paypal or Venmo and are ordered by a Direct Message on Instagram. 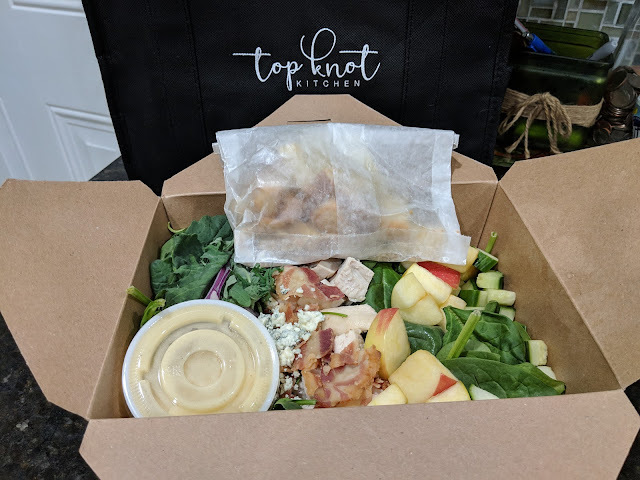 The salad was more than enough for the two of us and this one contained a nice blend of spinach, apples, chicken, bacon, cheese, croutons and other things. Whether it's a break from cooking, help with a healthier diet or just having a good dinner without the fuss, it's sure to please. 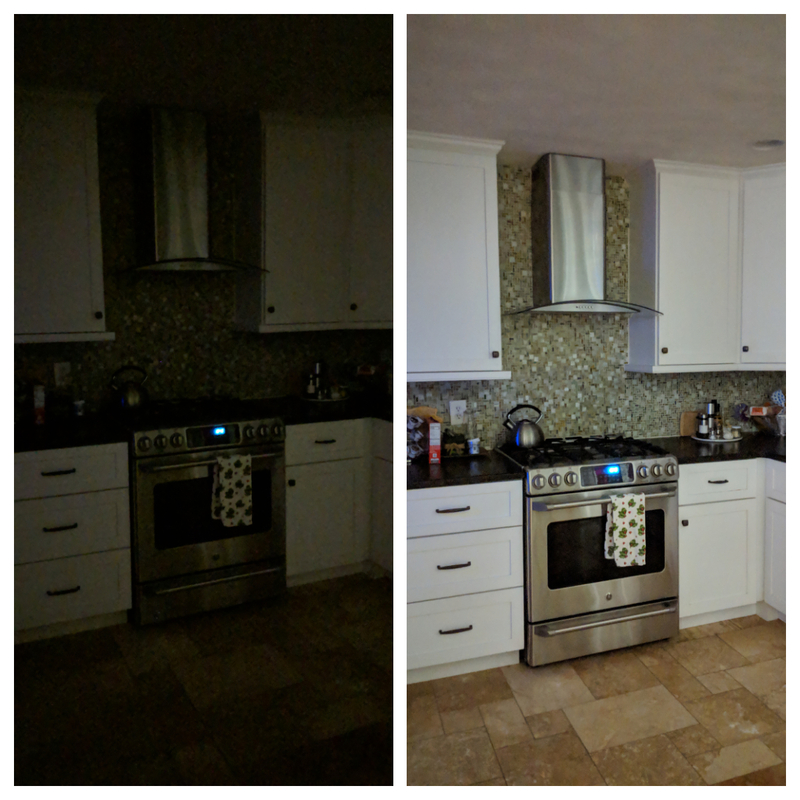 With just a living room light providing some around-a-corner faint illumination, I took a picture of our kitchen, as shown on the left below. Then using my Google Pixel 2's Night Sight option, I took the same picture in the exact same light, no flash involved. As you can see, the Night Sight version looks like I took the picture in daylight. Like the author of this Engadget article that goes into more detail, I was blown away by the results. 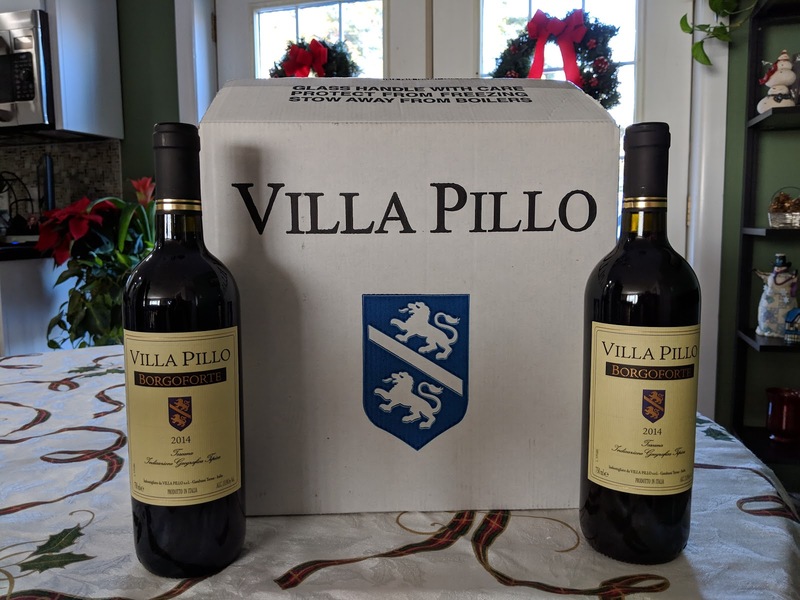 This is our choice for the holiday's red wine, a 2014 Villa Pillo Borgoforte Toscana, which garnered a 91 point rating from Wine Spectator and came in at #25 on their list of the top 100 wines of 2016. Best of all, it's currently on sale for $11.99 per bottle (then add shipping) at the link below. 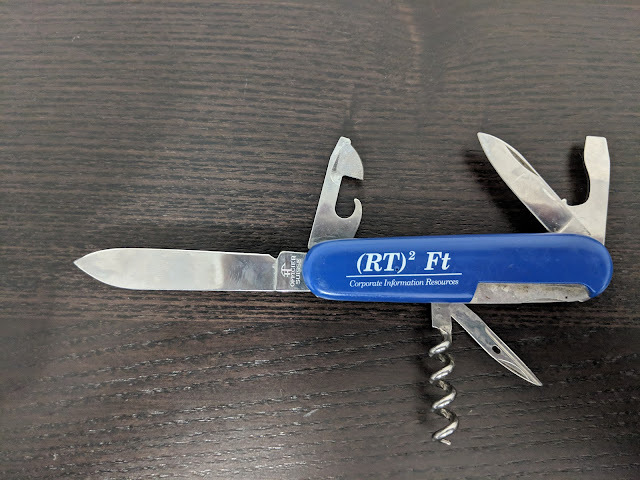 One of many gifts from our Mead Corporation CIO, John Langenbahn, was this Swiss Army knife that I still keep in my Jeep, and dates back somewhere to the mid-to-late 1980's. Our department name, Corporate Information Resources, was a testament to his futurist-thinking on how important information would be and that we were a valuable resource to the success of the company, not just a purveyor of hardware and software technologies. The logo, (RT)2 Ft, means "Right Things Right The First Time" and was created by the team to express how we wanted to approach our jobs, day in and day out. Being the techie group we were, we just had to make a mathematical formula out of it, and it was useful for branding purposes. The Mead Corporation is long gone, merged with Westvaco Corporation in 2002 to form MeadWestvaco, then again in 2015 with their RockTenn merger to form today's WestRock Company. But the Mead name is still alive, owned by ACCO Brands, delivering high-quality school and office supplies. 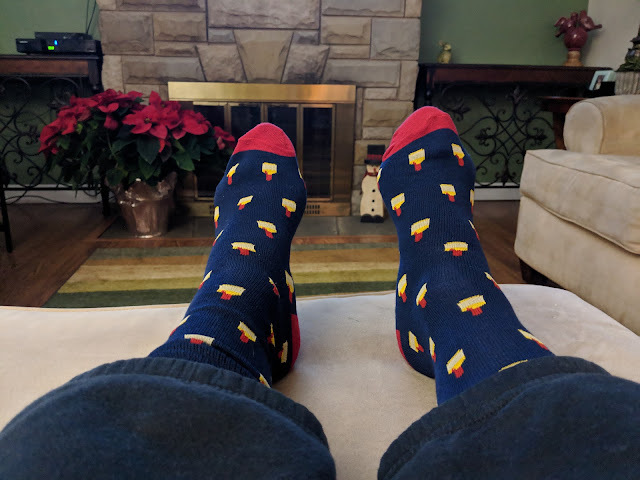 It's a bit strange, at 63 years old, to get excited when the free (I love free) yearly Maker's Mark Ambassadors Club Christmas gift arrives in the mail, and as usual they've provided a thoughtful and useful gift, with 2018's addition being these festive socks. Thin yet warm, they will provide comfort and joy this winter as we binge on our current Netflix series, The Marvelous Mrs. Maisel. 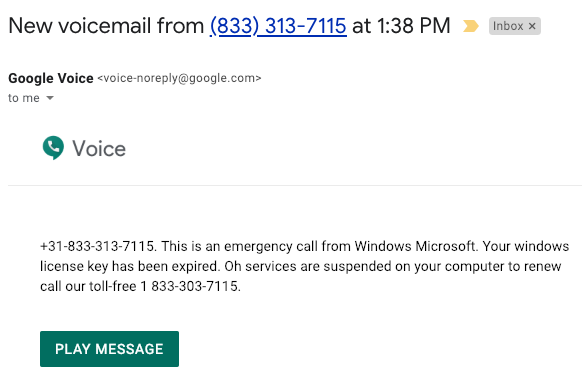 Amazing that these scammers were able to pack five obvious errors into just three sentences. Not to mention that I have Android, iOS, macOS and ChromeOS devices, but not Windows. Sigh. 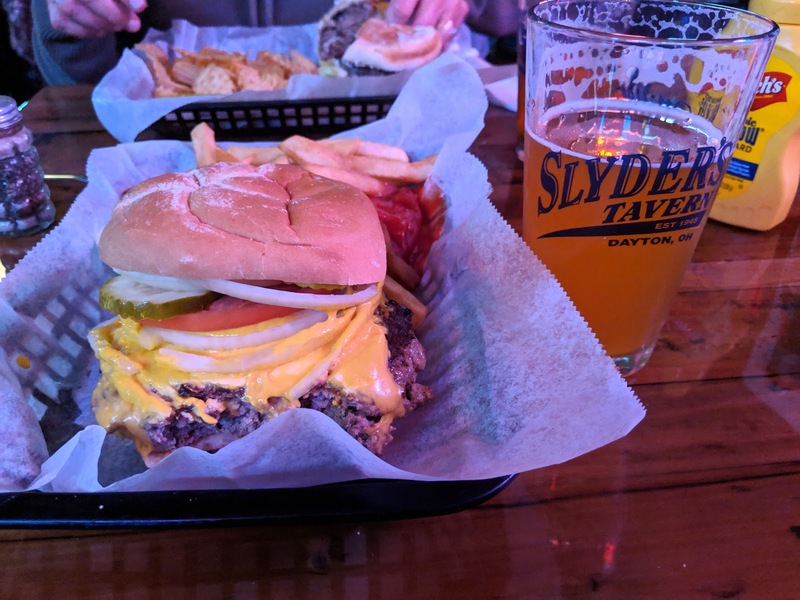 Tucked away in south Dayton's Belmont neighborhood, Slyder's is home to the best burger around. The monster below was the larger 10 ounce version, and lessoned learned, I'll be getting the regular 7 ouncer next time. Add one of their on-tap craft beers, in this case a Bell's Winter White Ale, and dinner was perfection. 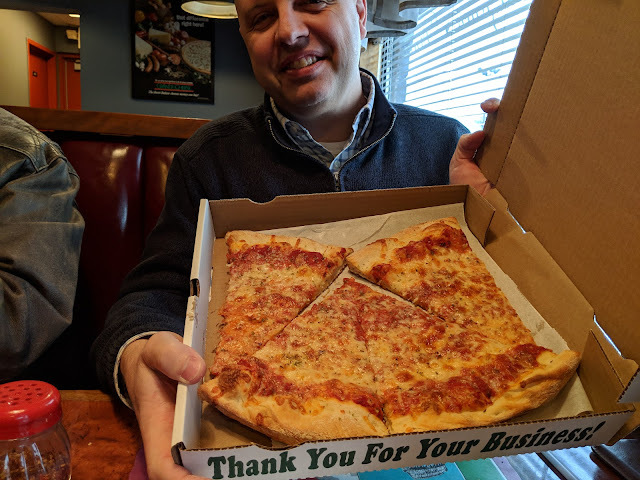 Courtesy of my friend Keith's brilliant daughter Lydia comes this out-of-the-box, in-the box thinking on how to arrange half a large, leftover pizza in a square, just-large-enough, take-home box. By separating and turning two pieces 180 degrees, it makes the half-moon-shaped leftover pie almost square. My jaw dropped when he demonstrated how easy it was. This women has a very bright future ahead of her. And Dad was beaming with pride. GIPHY is a free (I love free) Mac utility that captures whatever portion of your screen you want and turns it into an animated GIF. To demonstrate, I downloaded a free (repeat the love) video from Pixabay of crashing waves and ran the video while GIPHY recorded a selected portion of it. Then using some of the available options to reduce the size of the resulting GIF, I saved it and uploaded the result to include it below. When another vehicle kicks up debris off the road, the driver isn’t at fault – for example, if the truck in front of you drives over a rock and it hits your windshield, they’re not responsible for the damage. When another vehicle drops debris (gravel, trash, tools etc.) it’s transporting the other driver is at fault – for example, if a contractor drops a ladder off their truck they’re responsible for any damage to your car. As a practical matter, I would bet that if your windshield is damaged by an object that could have come from either the truck or the road, you would have to prove it came from the truck, so some third-party proof (e.g. video, witness) would be necessary. 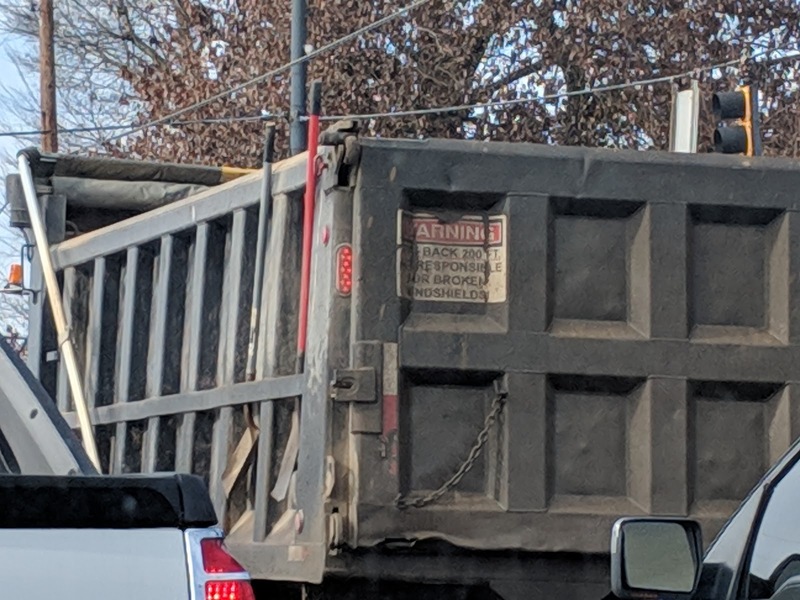 So staying back is good advice, even if their "warning" that they are "not responsible" is wishing thinking. 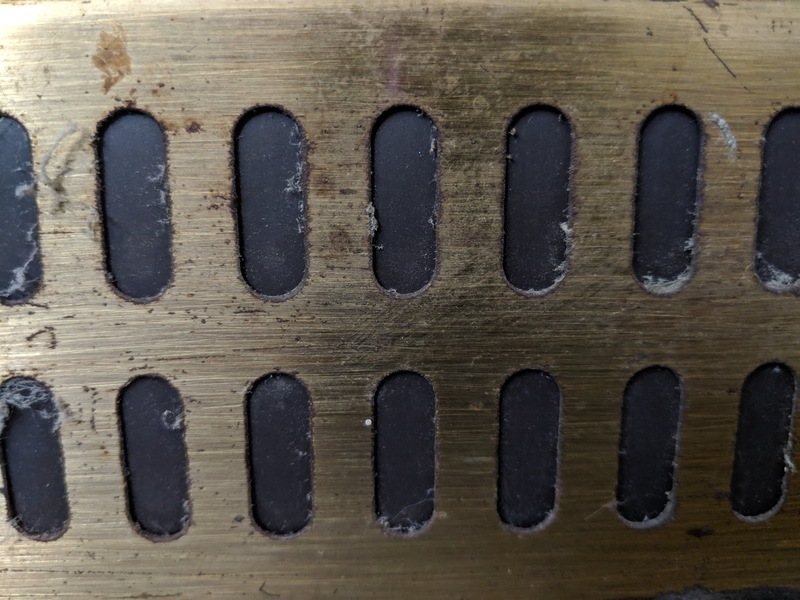 With no way to close off the holes at the bottom of the fireplace door, in order to keep out a steady flow of winter air, I pondered several ways before figuring out that a magnet would naturally stick to the metal frame, avoiding the use of glue or tape, and getting a good seal. I bought a package of flexible magnetic sheets from Staples, the kind you would use to print custom refrigerator magnets, cut one sheet horizontally into three pieces to the needed height and put them in place with the white side facing away and the black side facing towards the living room, as shown below. Problem solved at a minimal cost.